Rhode Island Governor, Lincoln Chaffee, was met by vocal opposition this week at the tree lighting ceremony for his state’s official holiday tree. That is right; he called it a holiday tree instead of a Christmas tree. After he lit the tree, a few dozen protesters started singing “O Christmas Tree.” Their contention was, of course, that calling the tree a holiday tree rather than a Christmas tree diminished the religious significance of the season. Yet, I wonder if it is possible for anyone to do anything that will diminish the religious significance of the season any more than it has already been diminished. Governor Chaffee defended his actions by noting that his predecessor had referred to the tree as a holiday tree, and in that sense, he was just following precedent. He referred to his state’s founder, Roger Williams, who fled religious persecution in nearby Massachusetts, and founded the Rhode Island colony as a place where individuals could exercise freedom of conscience. At the unveiling of the statue of Roger Williams at the US Capitol in 1872, Rhode Island Senator William Sprague observed that Roger Williams, “successfully vindicated the right of private judgment in matters of conscience, and affected a moral and political revolution in all governments of the civilized world.” Williams was no antagonist toward religion. In fact, just the opposite was true. Shortly after founding the new colony, Williams organized what would become the First Baptist Church in the new World. Ironically, Williams likely would have been at a loss for words regarding what to call a tree used to celebrate or commemorate the Christmas season. Why? Well there simply were no trees, Christmas or otherwise during William’s day. They are later additions to the way we observe Christmas, and likely did not appear in this country until the 1700s or early 1800s. Therein, lies a deeper irony. Christmas, what it is and what it means, has become a muddled dispute about what to call a tree. Trees, wreaths, lights and lawn ornaments are, for some people, a helpful way to enter into the story of Christ’s birth. For others, they add no particular inspiration beyond the festive brightness they add to an otherwise barren winter landscape. To the extent that they are helpful, they ought to be encouraged. To the extent that they become a distraction, they ought to be set aside figuratively, if not literally. God is coming. We as Christians have a hard time getting our minds around that reality. The very idea of God taking on flesh and dwelling among us is something we know as wonder and mystery. Our capacity to embrace it and celebrate it is a part of God’s gift of faith to us. How, then, can we expect an unrepentant world to celebrate what we ourselves only know of because of God’s gracious gift to us? Such expectations seem unreasonable, even as such disputes diminish our testimony and lessen the impact of that first Christmas on the world today. There really is nothing about which to argue. Christmas has happened, is happening, and will happen. God is coming. There is nothing anyone can do or say that will change that reality. What is essential for us is to enter the story of God’s coming more fully, leaving behind whatever keeps that divine child from being born anew in our lives, and taking hold of whatever causes his presence to be more real in our lives and be more evident in our living. The story of Christmas is a story of good news. It is a story to which we are not merely meant to listen to, but to enter. If all we ever do is listen to the story, the carols, and the sounds of the season, we have missed God’s intention for us. We are invited to join the story and to let our lives be shaped by it so we become a part of the good news God so wonderfully and miraculously proclaimed that night long ago in Bethlehem. ATLANTA (ABP) – The Cooperative Baptist Fellowship Coordinating Council voted by e-mail May 26 to recommend a 2011-2012 budget of $12.3 million at the group’s June 22-25 General Assembly in Tampa, Fla. The amount is $2.2 million less than this year’s budget, which at last report was running at 84 percent of projected revenues. The council was prepared to vote on a $12.9 million budget prepared by staff in February, but based on shortfalls in contributions decided that projection was overly optimistic and sent it back for more trimming. A cover letter from CBF moderator Christy McMillin-Goodwin explained the $662,491 trimmed from the budget since February. More than half of the reductions — $350,000 – were in global missions, although no missionaries will have to be called off the field. Non-global missions cuts totaled $312,491 and included reduced funding for four seminaries labeled “identity partners” to the CBF. A copy of the budget summary obtained by Associated Baptist Press showed reductions of about 17 percent for two partners: ABP and the Baptist Joint Committee for Religious Liberty. Funding for ABP is reduced from $77,000 to $64,000 and the BJC from $126,000 to $104,000. Funding levels are unchanged for the Baptist World Alliance ($45,000), Christian Churches Together ($2,000), Church Benefits Board ($50,000) and North American Baptist Fellowship ($1,000). McMillin-Goodwin, minister of education and missions at Oakland Baptist Church in Rock Hill, S.C., said in the cover letter that staff sought to implement suggestions from roundtable discussions held by council members in the February meeting. McMillin-Goodwin said significant cuts were achieved in global missions by shifting categories of service for some field personnel. That included changing a policy that now allows one spouse in a unit to move to self-funded status while the other spouse remains fully funded. While no one is losing a job, she said, jobs currently vacant in global missions will remain unfilled. The Fellowship, which celebrates its 20th anniversary this year, reduced staff in Atlanta and satellite offices by 16 positions in January, saving – with program cuts – about $1.1 million in the current budget year. Our first response ought to be to keep doing what we have been doing. Since CBF is our primary partner as we seek to fulfill Christ’s Great Commission, we support CBF in our budget. That means that a portion of every undesignated gift that you place in the offering plate goes to share the love of Christ through the ministries of CBF field personnel in the United States, and in the uttermost parts of the world. Your giving to the Lord’s work this year has been commendable. In these difficult economic times, your faithful support of what God is doing in and through our church is a testimony to your commitment and desire to see others experience the love and grace of Jesus Christ. Our operating budget is not the only way that we support CBF. Two times each year, at Christmas and at Easter, we receive an offering for Global Missions. These offerings go to support our CBF missionaries as they tell the story of God’s love, and as they demonstrate that love in meaningful ways among some of the most neglected and least evangelized people in the world. Our second response ought to be to start planning now, well before Christmas gets here, to do something special when it is time for the Christmas Offering for Global Missions. What better gift can we give at Christmas time than to give Christ to someone who has never known him? Our third response is our most important one — prayer. Use the phrase from the above report, “jobs currently vacant in global missions will remain unfilled,” as a prompt. Pray that current vacancies can be filled. This is a vitally important prayer concern when we consider the way that CBF prioritizes needs on the mission field. CBF always tries to go where there are no or few missionaries already at work. They target people groups that have had little or no contact with the gospel of Jesus Christ. Therefore, if a position is vacant, it is a position among people that have limited or no opportunities to hear the message of God’s love for them. Some of those people may have to wait for those unfilled positions to get filled before they can be introduced to God’s saving grace. It is truly a vitally important prayer. Please pray it with me and be thinking of what you can do to make your Christmas Offering for Global Missions extra special this year. I am having a real love/hate relationship with all of the snow we have been getting this winter. I hate that it has caused us to miss a Sunday morning of worship, and that it has interfered with our scheduled activities on two Wednesday evenings. On the love side, even though I want all of the children to get all of the education that they can, I do not begrudge them their days out of school due to snow. Is there anything better than a snow day? Yet, even lovelier than a day off from school, is the way that snow covers the landscape. Blanketing the ground, clinging to the limbs of trees, and balancing on wires, it creates art in such a way that no matter where you are, you are standing in the middle of a picture. The beauty of snow-covered landscapes almost always reminds me of God’s creative activity in the world. Standing outside in the night, as the snow is falling and covering everything that it touches, is an awe-inducing experience. The glory of God’s creation cannot be contained as it beautifies the darkness. At the same time, I am mindful that what I am experiencing as beautiful is creating an altogether different experience for some. They are cold without warm shelter to shield them from the night. The snow does not prompt them to think of God’s presence. Left alone in the cold, at best they ponder the absence of God — at worst, they rail against a cruel deity that would allow it to snow on people who have no protection from the harsh night. It is easy to get stuck in the snow, especially for those of us who do not get much practice driving in such conditions. As believers, it is also easy for us to get stuck in the creation, or least in the questions of creation. How did we get here? Does the Genesis account of creation say all that there is to say about the origin of life? Can Christians be faithful in their relationships to God without ignoring what science would teach us about the human experience? These questions would be much more important than they are if creating us was the last thing that God did for us. However, God did not just create us and leave us. God created us and came to us. In coming to us in Christ, God invites us to live the life God intended for us. In Christ, we see that life modeled. The early church recognized Jesus in the words of Isaiah, “…a bruised reed he will not break, and a dimly burning wick he will not quench; he will faithfully bring forth justice.” In a time and place marked by its share of suffering and wrongdoing, Jesus lived with a gentleness that would not break an already bruised reed nor extinguish a weakly burning flame; yet with his life, he brought light to the nations, sight to the blind, and justice to the oppressed. He invites us to such a life. God did not create us just so that we could wile away our days admiring the artistry of God’s handiwork. God made us, redeemed us, and invited us to live lives that shine light, open eyes, and do justice. God invites us to live in such a way that those who find themselves without shelter on a cold winter’s night will know that they are not alone and that they have not been created only to be abandoned by God. They will know because they will see the love of God being shared by the people of God. Ron Crawford, president of the Baptist Theological Seminary at Richmond, and former pastor of College Park Baptist Church in Orlando, Florida, wrote last week at EthicsDaily.com about “Catch-up Sundays.” Catch-up Sundays are those special days set aside by a church’s finance or stewardship committee to get the church’s giving caught up with where the church’s budget says it ought to be, or where the church’s spending says that it needs to be. Crawford’s contention is that such special giving days rarely work and can even be detrimental to the financial health of the church. To be certain, such special days can result in especially large offerings. He suggests that many times those offerings are made with dollars that would have been given to the church without the special emphasis. The special emphasis just caused them to be given earlier in the year. Therefore, the church finds itself in a similar pinch a few months later. The detrimental impact of catch-up Sundays is that it can take the focus off of regular, faithful giving on the part of church members. Giving to God’s work through the local church is not something that we wait to do in times of crisis or emergency. It is something we do on a regular basis as we live out our faith day by day. As I was reading Crawford’s article, the question came to me as to why we were not having a special catch-up Sunday at Ball Camp. Given the state of the economy and all the transition going on in our church, one might think that the conditions would have been right for some disruption of giving at some point this year. Whether they work or not, there have been years when we have done catch-up Sundays in an effort to get our income to be ahead of our expenses. However, there has been no talk of doing one this year. My curiosity got the best of me and I opened our treasurer’s report for November of this year to check our year-to-date general fund income. Janet pulled last year’s file so that I could compare our November of this year with last year’s numbers. Amazingly, this year’s income is ahead of where it was this time last year. I thought we might be close, but I did not expect that we would be ahead of where we were last year at this time. With gratitude for the way that God has provided, let me commend you for your faithfulness to our church and the work that God is doing in and through it. Your understanding of and commitment to regular giving has resulted in a financially healthy faith community that is impacting the world for Jesus Christ. This year, your gifts to our general fund budget have not only provided for our ministry here in our community, but have enabled us to partner with others in sharing Christ’s love. We have supported the work of Cooperative Baptist Fellowship Missionaries in the uttermost parts of the world, and especially in North Africa. We have partnered with Carson-Newman College, the Gideons, the Baptist World Alliance, Family Promise of Knoxville, and Western Heights Baptist Center to do ministry at home and abroad. Your faithful giving is touching lives and making a difference for Christ. However, you have not just shared Christ’s love through your giving to the general fund budget. You have also done it through special offerings over and above your regular gifts to the church. This year you gave generously to those whose lives were turned upside down by the earthquake in Haiti. You gave an offering to Faith Comes by Hearing to help record the Bible in the heart language of an unreached people group. Can you imagine what it will be like for those people to hear God’s word in their own language for the first time? You helped make that happen this year. You have given faithfully to Global Missions at Easter and are giving again here at Christmas time. You have supported the Tennessee Cooperative Baptist Fellowship’s Tennessee Partners in Mission Offering. You supported our young people so that they could go on their mission trip to Ohio. Some of you have designated gifts to the work of the Southern Baptist Convention. Of course, you have given other gifts as well. Some of them I am aware of and some of them I am not. Yet, each of those gifts has been a sharing of Christ’s love and tangible reminder to someone or to a group that Christ is present with him, her or them. Your willingness to regularly give above and beyond has made every Sunday a special offering Sunday at Ball Camp this year. There is a bit of red in our treasurer’s report. Our Benevolence fund is just over $200.00 to the negative. This is the fund we use to minister those in our church and community who find themselves in need of help with rent, utilities or fuel. We have spent more than we had to spend in order to help those in need. Money for this fund is traditionally given at the conclusion of worship services in which we have celebrated the Lord’s Supper. Please be mindful of the poor and needy as we celebrate at the Lord’s Table on Christmas Eve and on the first Sunday in January. I know you will. You always are. 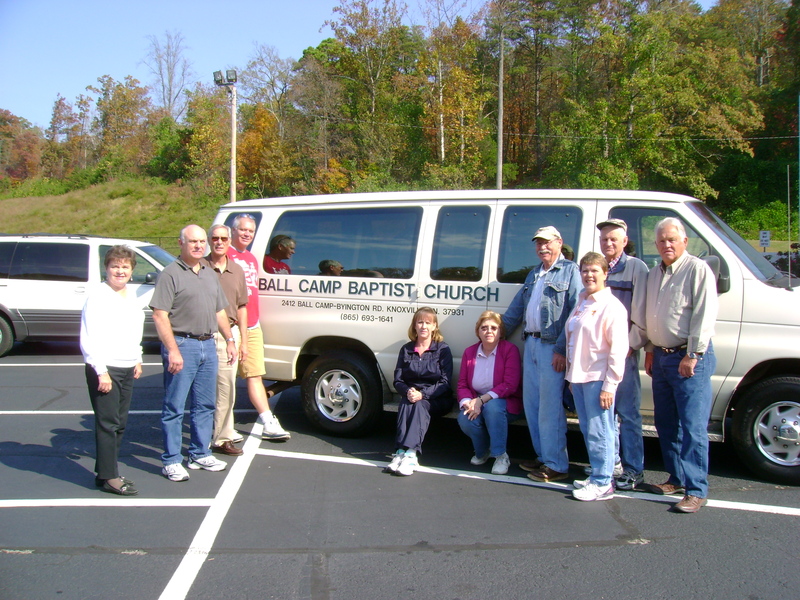 Thank you for your faithfulness this year to God’s work in and through Ball Camp Baptist Church. Working in a concession stand in the cavernous underworld of Neyland Stadium, you meet some interesting people. He was wearing blue and white. His shirt was blue and his hair was white. This was not his first football game. The University of Kentucky insignia on his shirt made me wonder if he had lost his sense of direction. Tennessee was getting ready to play Florida, and his Wildcats where 170-odd miles to the north, getting ready to play the Zips of Akron. His explanation was that Kentucky was not playing an opponent worthy of his time and effort. He wanted to see a more competitive game, so he came to Knoxville. Still, he seemed just a little out of place. I think he sensed that as well. When I gave him the hot dog and Coca-Cola that he had ordered, he did not pick them up and return to his seat. Rather, he moved down the counter a foot or two and started to unwrap his hot dog. I thought he might just be checking to see if his packets of mustard, ketchup and relish were actually inside the wrapper, as I had told him they were. Instead, he turned his corner of the concession stand into a lunch counter, and proceeded to munch on his hot dog and drink his Coke. His standing there to eat seemed a little strange to me, but then I realized he was most likely sitting in a section of the stadium that was full of Florida fans. Perhaps that was the source of his reluctance to return to his seat. Of course, he could well have been sitting next to Tennessee fans and that might not have been much better for someone wearing a University of Kentucky shirt. Either way, I wondered if he felt a bit lonely and out of place. He was the only person I saw wearing Kentucky blue. Now, I doubt that he did feel lonely. He obviously knew who he was and why he had come to this place. Knowing who we are, and why we are where we are, is essential for followers of Christ if we are to be faithful to the call of Christ on our lives, while living in a world full of folks whose behavior and values sometimes, if not most of the time, cause us to stick out like a UK fan at a Tennessee/Florida game. The way of Christ calls us to humility, concern for the needs of others, honesty about our own shortcomings, and trust in God and God alone. The world in which we live places great value on glitz and celebrity, power and personal gain, winning at all cost, and trusting in whomever or whatever will get us what we think we want. When Jesus said, “I am sending you out like sheep into the midst of wolves,” He was not exaggerating. Our culture has a riptide effect that can sweep us along through life, conforming us to its norms and values without our ever giving a second thought to what we believe, why we believe what we believe, or the implications of that belief. When Jesus said, “be wise as serpents and innocent as doves,” He was serious about making a distinction between the behavior and values of His followers and those who were not His followers. More importantly, He was concerned about making it clear to those who would follow Him that doing so would cost them the luxury of fitting snuggly and warmly into the world in which they lived. Following Christ means intentionally entering into a process that forms us in the image of Christ, by the working of the Holy Spirit, for the sake of the others. Simply put, as followers of Christ we want to be spiritually formed by Christ and in Christ in order to transform the world, not to conform to it. Jesus does not send us out among wolves so that we will become wolves. So then there will be times if we are obedient to the call of Christ, that we will find ourselves sticking out like a UK fan at a Tennessee/Florida game. Do you remember when you were lost, alone and separated from God? Do you remember when the guilt and shame of sin kept even a ray of hope from shining on your life? Do you remember when you were saved, forgiven? Do you remember the joy and the peace, the relief and the release that came from knowing how much God loved you? Do you remember discovering for the first time in your own life that God made a way for you to be accepted and whole, liberated and redeemed? This week, at the annual General Assembly of the Cooperative Baptist Fellowship, 16 people were commissioned to go to some remote places on this earth for the sole purpose of sharing the Good News of Jesus Christ, so that they who have never heard might experience the same joy and the same grace that you experienced when you first learned of God’s great love for you. These 16 will go to China, Southeast Asia, the Philippines, the Czech Republic, Spain, Eastern North Carolina, Chile, Georgia, Haiti and South Africa. They will join with others who have already gone. They go to plant churches, practice medicine, do poverty relief, train local church leaders, teach in universities and seminaries, minister to women and children, and facilitate the transformation of communities. All in all, they go to share the Good News of Jesus Christ, to be the presence of Jesus Christ, and to announce the Kingdom of God. These people, along with those who have been sent before them, go where they are going on your behalf. They go to more places to encounter more people than any of us ever could on our own. They go to tell and to live the story of God’s amazing grace for us. Our prayers are vital for all those who serve and who are sent; but our prayers are not the only way that we need to support and stand behind them. We also need to share our resources. At the conclusion of worship services next Sunday morning, we will be receiving an offering. That is our custom on Sundays when we have celebrated the Lord’s Supper. Normally our offering on Lord’s Supper Sundays is used to meet benevolent needs in our community. Right now, our benevolence fund is adequate for the needs we anticipate until we gather again at the Lord’s Table. Therefore, since the CBF Offering for Global Missions is running about 30% behind where it should be for this time of year, we are going to send our July offering for benevolence to the uttermost parts of the world.